The Oriental is a close relative of the Siamese cat who originated in the United Kingdom. 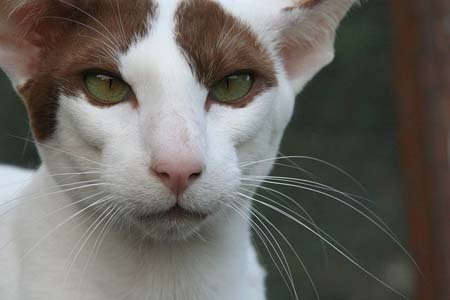 Breeders wanted to create a Siamese-type cat in different coat colours while maintaining the same modern Siamese type head with large ears and a long slender body which tapers to a whiplike tail. They are intelligent, loyal and devoted and are known to bond closely with their human family. The Oriental is a Siamese-type cat but in a variety of coat colours, instead of the colour points of the Siamese cat. First conceived in the 1950’s in the United Kingdom where breeders wanted a Siamese-type cat but in different colours. 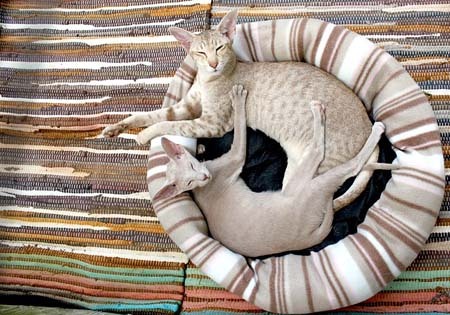 Siamese, Russian Blues, Abyssinians and domestic shorthairs were used to achieve this. Orientals were imported to the United States in the 1970’s. The CFA accepted them for championship competition in 1977. In the United Kingdom, the Oriental goes by the name of Foreign Shorthair, white Orientals are Foreign White and brown Orientals are Havanas. The Oriental has a wedge-shaped head with large ears and almond-shaped eyes. Body is long, tubular and muscular, the legs are long and slender, and the paws are oval. The tail is long and tapers to a fine point. The coat should lie close to the body, be soft, fine and glossy, with no trace of a coarse texture. One thing I have noticed on both of the Oriental cats I’ve had has they had a scattering of grey hairs around their neck. 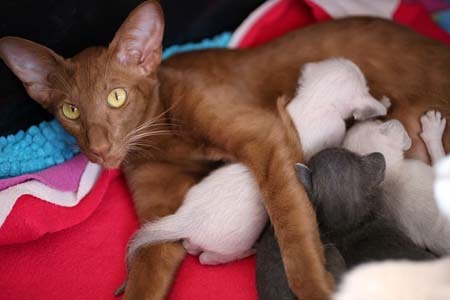 The Oriental can come in all colours with exception to pointed, according to the Cat Fanciers Association, the Oriental comes in 600 colours and patterns in short and long hair. 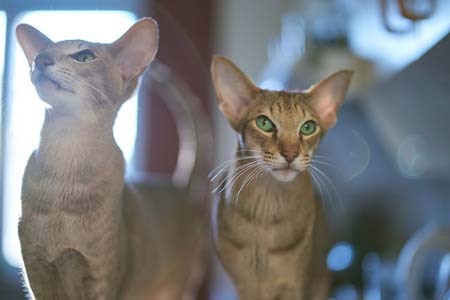 The Oriental is very similar to his Siamese cousin in personality and can be quite talkative as well as friendly, confident, outgoing, highly intelligent, lively, sociable, curious and affectionate. They stay kitten-like well into adulthood. Despite being an active breed, they also love to snuggle on your lap on an evening. Orientals make a great family pet and get along with everyone, they are known to become extremely attached to their human companions. We recommend a feline companion if you are out of the house for long stretches as Orientals thrive on company and can get lonely on their own. 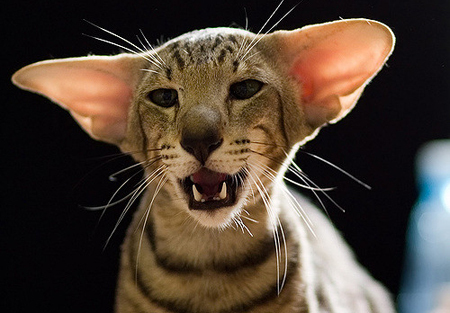 The Oriental is a healthy breed of cat with no real health concerns, that said, when buying a purebred cat, you should always obtain a health guarantee from the breeder.